It started with a donation of 500 coffee mugs to the United Way in 2014. After finding out that there is a surplus of coffee mugs in the world, what was the United Way to do? For the past two Christmas’ the United Way has provided over 300 gifts to OSHaRE for their patrons at Christmas. 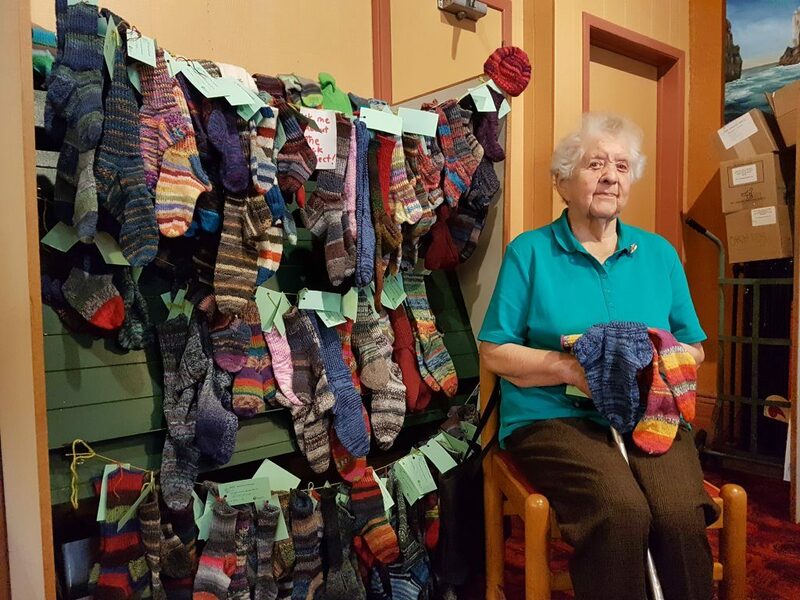 The project received a huge boost with a donation of 50 pairs adult socks and 40 children’s socks from a phenomenal local knitter Gertrud Gaissmayer of Kemble, whose daughter Angelika Hammel read about the project in the Ginger Press’ MOSAIC magazine. In addition to adult socks for OSHaRE patrons, children’s socks are welcome because non-custodial parents cannot access the toy drive and therefore often are unable to gift their children something at Christmas. “Being able to select a mug and pair of socks to give to their children really helps non-custodial parents at Christmas,” United Way Executive Director Francesca Dobbyn explained. More handknit socks are welcome and can be dropped off at the United Way and the Ginger Press in downtown Owen Sound. The United Way also has a knitting program called “Operation Big Warm Hug” that accepts knitted scarves, mitts and hats to be distributed throughout the region as part of their regular supports. Recently 200 scarves were recently donated to be given out with the Backpack Program.